This week’s reading was about critical media literacy, while we explored visualization as educational technology, specifically word clouds and infographics. I had consumed many infographics before but had never created one. The biggest problem experienced while creating an infographic with Canva, the recommended tool, was the lack of collaborative editing ability. As a result, collaboration for our exploration took the form of division of labour. My classmate prepared copy for the infographic and I did the layout in Canva. Screencasting enabled us to complete the exploration. However, the lack of direct editing ability made the learning experience more about contributing and commenting than about collaborating. Perhaps I’m trying to split hairs by parsing a difference. Even still, I have wondered about this difference since Josh DiPasquale (2017) posted about the lack of direct collaboration in the Principles of Learning wiki assignment. I think there is a distinct difference between a product that is the result of uncoordinated serial editing and a collaborative process where roles and responsibilities are fluid. (I would like to explore this perceived difference further. Models such as online collaborative learning (Harasim, 2012) and community of inquiry (Garrison, Anderson, & Archer, 2000) do not seem to discuss the mechanics of collaboration.) The process of creating our infographic was somewhat collaborative but not as collaborative as creating a Google Drawing because of the limitations of Canva. On the other hand, the templates Canva provide beautiful starting places. The other area for exploration was Wordle word clouds. How do I begin reflecting on my experiences? 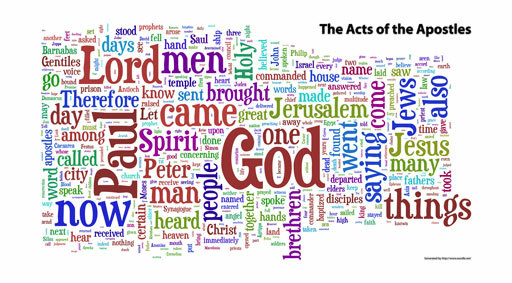 I created my first Wordle for educational purposes late in 2008 for a course on the biblical book of Acts. Wordle analyzed and displayed the frequency of the ~24,000 words of the book. I encouraged students to use the 32” x 58” printed graphic to explore themes and patterns. While the learning experience seemed helpful for students, we also grappled with how crude of a tool word clouds could be. Most obviously, Wordle counts inflected forms, not word stems or roots (for example, walk, walking, walked, etc.) (Feinberg, 2014). Further, a Wordle has a very low signal to noise ratio. The colour, font, location, and proximity of words are meaningless. These decisions are either left to the aesthetic whim of the creator or determined by algorithm to optimize the layout. Critics have pointed these weaknesses out (Milligan, 2013), calling word clouds harmful and dubbing them the mullet of the internet (Harris, 2011). Many have proposed alternatives for textual analysis (Conway, 2011). I was surprised to find that Jonathan Feinberg, the creator of Wordle, discussed these weaknesses before many of the critics (Feinberg, 2010). Research conducted on how people who use Wordle feel found that creative was the response with the highest level of agreement (Feinberg, 2010). The recognition of the weaknesses and the research finding that participation is a key benefit has helped to temper my growing skepticism about the benefits of word clouds. (Although my skepticism grew again when I read that the research subjects could not accurately identify that word frequency determined word size (Feinberg, 2010)). This is where my thinking intersects with our critical media literacy pedagogy reading. Garcia, Seglem, and Share (2013) advocate that critical media literacy requires that students not merely consume media, but also produce media. Or, to use Rushkoff’s (2010) imagery, that students learn to program to avoid being programmed. Creating media would seem to demand that students learn the characteristics of visualizations and learn to design graphics appropriate for their intended use. Critical media literacy can build on this foundation of visual literacy. There are general approaches to building visual literacy that pushes far beyond word clouds and infographics. 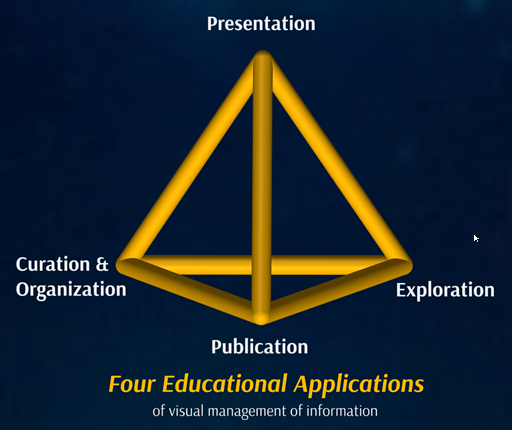 See, for example, the work of David McCandless and Edward Tufte and A Periodic Table of Visualization Methods. Particular to the field of theological education, Brown (2015, 2016) attempts to build visual literacy for theological educators in a book chapter and a Prezi. 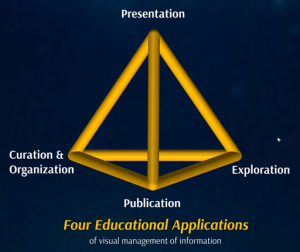 I am particularly interested in learning more about his concept of the tetrahedron of education applications of visualizations. I think it might help me clarify my thinking even further on the right ways of using visualization in theological education. This post is the seventh in a series (first, second, third, fourth, fifth, and sixth) for this semester’s course, “Digital Tech in Adult Ed,” with Dr. Rob Power at UOIT. Garcia, A., Seglem, R., & Share, J. (2013). Transforming teaching and learning through critical media literacy pedagogy. Learning Landscapes, 6(2), 109–124. Brown, A. (2015). Visualization in theological education: A taxonomy of purposes, tools and possibilities for visual representation for the non-specialist. In Y. Debergue & J. R. Harrison (Eds. ), Teaching Theology in a Technological Age. Cambridge Scholars Publishing. Feinberg, J. (2010). Wordle. In J. Steele & N. Iliinsky (Eds. ), Beautiful Visualization: Looking at Data through the Eyes of Experts. Sebastopal, CA: O’Reilly Media. Harasim, L. M. (2012). Learning theory and online technologies. New York, NY: Routledge. Rushkoff, D. (2010). Program Or Be Programmed: Ten Commands for a Digital Age. OR Books, LLC.